Are you a Singer, Comedian, Dancer, Juggler? Come and shine and show us your talent! Thursday 2 August @ 1.00pm at ARTWORKS, Elephant Road, SE17 1AY (Registration from 12.30pm). No registration is necessary prior to the dates above – please just turn up on the day. Performers will need to bring their own equipment, music, costumes and anything else they wish to use during their performance. 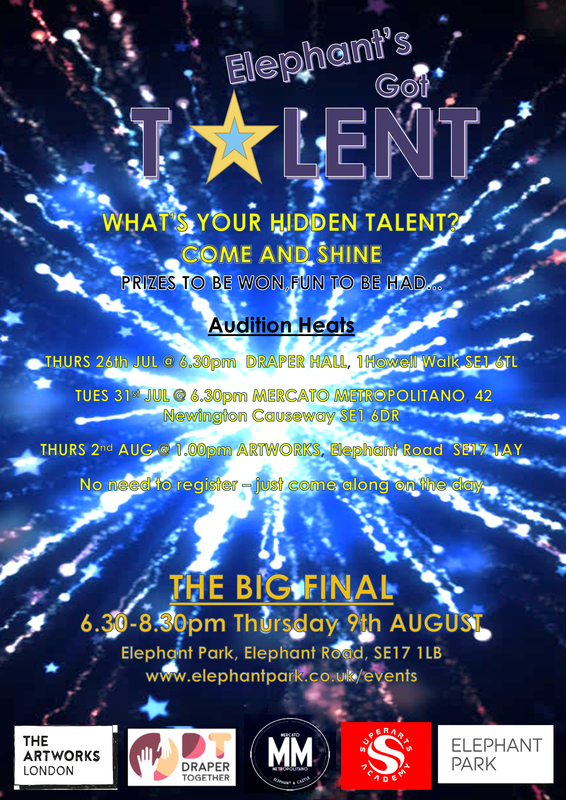 THE BIG FINAL WILL BE HELD ON THURSDAY AUGUST 9th / 6.30 – 8.30pm at ELEPHANT PARK, Elephant Road, SE17 1LB.